That the modern age is an era of great religious speculation will be apparent to even the most casual student of its literature; that it is also an age of great religious faith no one can contest. As things stand, it is evident that not a few contemporaries would be disposed to concur with the popular view that men cannot do without religion, and that they cannot all do with it as it is. But, surely, it is the dialogue of the human mind with itself that characterizes man's continuous search for spiritual meaning in the modern would. Yet, presently, Nigerian men of God have set their stamp more strongly on the general character of the Christian religion as a way of life. During the last few decades, our generation in particular has seen a re-orientation of our mind and soul, which implies not only a permanent change but, indeed, a shifting of the spiritual horizon, with far-reaching results. All these swiftly rising new men of God in Nigeria, whose names we now recognize as stimulating signals, have one thing in common: they are fully and truly committed. And their congregations greet them with enthusiasm, no matter the location. One of these anointed servants of the Most High is the man who is the focus of our attention today. 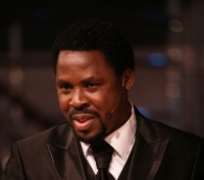 It is hardly an exaggeration to say that Prophet Temitope Balogun Joshua, who clocked 46 on Friday June 12, 2009, more than any of his contemporaries, has exerted a tremendous influence on the spiritual and economic life of his teeming congregation in particular and humanity at large. This piece is not an attempt to embark on a deconstruction of T.B. Joshua. In fact, I have never met this man of God, neither have I exchanged correspondence with him since the past fifteen years of my involvement in this busy profession of minding other people's business, especially its most intricate and intellectually engaging aspect, the business of informed commentary and editorial writing. Admittedly, to offer an honest critical evaluation of the whole corpus of criticisms of this controversial pastor is certainly an ambitious undertaking. But it would be more rational to repudiate the cynical over-simplification by fifth columnists and court jesters whose major pre-occupation it is to ridicule someone who has practically and positively ministered to the vast majority of the downtrodden. It is certainly not the business of this column to question the fabrics of the moving saga that wove into autonomous existence the circumstances that surround the dramatic emergence of this spiritual challenger. Amidst the ponderous saga of some "holier-than-thou" men of God who tax their congregations to build schools, colleges and universities to which they (members) cannot afford to send their children due to exorbitant fees, Joshua has awarded scholarship to thousands of his members and even beyond. His consistent life style has already given proof of his individuality as a true servant of God. And the manifest hand of God that radiates through his ministration has drawn many lost sheep back to the Body of Christ. A close look at the circumstances of his life shows that Prophet Joshua was born with the natural requirements for a calling of an ideal tendency. In recent times, I have heard not less than three pastors, hitherto doubtful of Joshua's spiritual credentials, now testifying openly that TB is a true servant of God. One of them even confessed at a meeting recently, where yours sincerely was in attendance, that but for his strong attachment and loyalty to his superintendent, he would have resigned to become one of Joshua's ministers. Whatever is responsible for this bout of proclamation, the truth is that in spite of the antics of his detractors schooled in the pull-him-down (PHD) syndrome, Joshua possesses a heroic pathos, and has infested in our very eyes an uncommon spiritual candour. Had Thomas Paine watched Joshua closely during his day he would probably not have made his famous declaration that "religion is the opium of the masses." As a testimony to his rising profile, Joshua has a large flock of Christian believers from Africa, Asia, Europe and Latin America and his healing power makes headline news in media houses around the world. Again, The Synagogue Church of All Nations at its Ikotun, Lagos headquarters, has played host to very important dignitaries from across the world. The tremendous growth in population of his ministry apparently accounts for the equally large viewership of his television network programme known as "Emmanuel TV". As a hard working, loyal and dedicated spiritual bulldozer who can shrink up the sundering seas, level all intruding mountains, bridge all gulfs and put a lamp in every tunnel, TB Joshua is undoubtedly a spiritual phenomenon whose corpus requires a large canvas. It is incontestable that the spiritual seriousness of the present times, so conspicuous in most Nigerian Christians, is due in no small part to evangelical Christianity, which has coloured the beliefs and practices of so large a segment of the populace. For, much as practical evangelism has nurtured the need for a religious faith in our society, it has inadvertently made allowance for the major ideological developments of the age. One of such biblical statements which have become the foundation for human ideological creeds is the command by Jesus Christ for Christians to give to the poor and needy. On this score, Prophet Joshua dwarfs all superlatives, at least in Nigeria. Whereas most men of God tax their congregations (sometimes to breaking point) to acquire aeroplanes and jets to fly all over the world, Joshua is one of the few men of God who have seen the need to invest in human capital. It is against the backdrop of this philanthropic activity that the Federal Government recently awarded Joshua the national honour of Officer of the Order of the Federal Republic (OFR). Bamber Gascoigne, the British journalist and television personality, in his book The Christians, says: "Whether He was God, man or myth, one thing is certain about Jesus Christ. He has made more impact upon the world than any other person in history." In fact, if I am tempted to refer to Prophet T.B. Joshua as a bundle of sublimity, it is because of his vitality; and it is the sheer humility and gentility in him that make for this position. Nor is this vitality any less obvious in his actions. For anyone who has ever tried to explain the making of a complete servant of God knows that goodness must be allowed to speak for itself. In any case, those opposed to T.B. Joshua are entitled to their opinion. And if Jesus Christ was Himself called all sorts of names and ridiculed by His people, who else is above human condemnation? God, alone, is the true judge!